The benchmark US dollar index was trading up slightly on yesterday’s level – but the index masked significant moves against individual currencies. The dollar was trading lower against the euro and sterling but rallied strongly against currencies exposed to China and commodities. The Canadian dollar, the New Zealand and Australian dollar all suffered heavy falls as China announced it would lower the managed band in which the currency floats. The move increases the value of the dollar against the yuan and therefore causes the value of dollar denominated commodities to fall. On the domestic front markets welcomed news that US productivity increased in the second quarter. Productivity was up by 1.2% on the previous quarter but the number missed expectations for a 1.6% rise. Labor costs also rose strongly in the second quarter adding to evidence that the slack in the employment market is dropping. The US Department of Labor reported that the unit cost of labor increased by 0.5% in the Q2. The figures are only preliminary however and may be revised. Hopes that the negotiations over Greek debt is drawing to a close helped support the euro today. An upbeat economic survey from Germany also added to bullish sentiment. The closely watched ZEW survey of economic sentiment for the Eurozone came in ahead of expectations at 47.6. The level jumped from 42.7 the previous month as German investors view a settlement over Greece in a positive light. Sentiment on the domestic economy fell however on the previous month. The index dropped to its lowest level in twelve months as investors saw potential for strong expansion going forward as more limited. 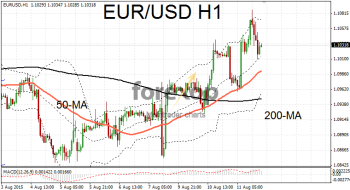 EUR/USD continues to rise on strong momentum but has suffered several large corrections over the past two sessions. 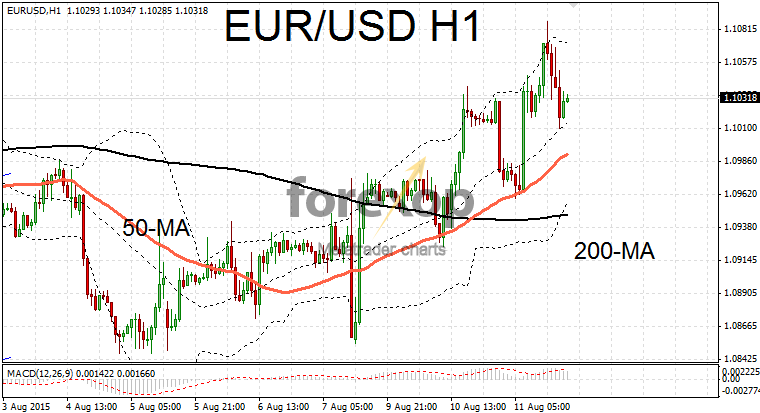 After meeting resistance at 1.1087 EUR/USD fell back towards rising trend line marked around the moving average. GBP/USD also posted solid gains lifted by news that officials may be closer to the first interest rate rise than was originally thought. One of the Bank of England’s policy makers told Bloomberg that there is a case for raising rates earlier to avoid sudden rises further down the line – something which may hurt consumers and potentially damage the economy. Cable is encountering resistance at the 1.56 level. Several attempts to breach the resistance area have failed and have seen the pair pushing back down towards the middle of the 1.55 band.